Hello, and welcome to my 87th review. Now this is a game that nza requested me to review probably over a month ago now and I've been lazy and stuff but now I'm reviewing it because he reminded me again and now I've been bothered. Yay. That sentence was long winded. Anyway, I vaguely remember playing this game when I was a 'noob' like four years ago, so I have no idea what my initial pre-thoughts back then were, probably "it's a shooter, I hate shooters *dies after one minute* this game is impossible" but when now I think well nza has a few featured shooters under his belt, some of his recent shooters have been pretty solid so I'd imagine this game would be decent as well. So now lets get in that time machine and go back a few years. So I didn't beat this game, I'm sure if I had a few more attempts I could, but I got far enough into the game to have a decent idea of what this game is all about. If I didn't have the urge to play this game a few more times then that probably hints that this game isn't superbly addicting but I have given it three shots so it does have some sort of addictiveness there. Looking at the leaderboard, I've seen that three users have beaten it, and I think that's quite a good difficulty (for me anyway). I like a challenging game, not one that's too hard and this seems to be that sort of game. Also Black Rose isn't too hard because it starts off simple with enough health supplied to the user and some pretty basic action sequences but as you progress further into the game, there are a lot more harder sequences and less health given to you. 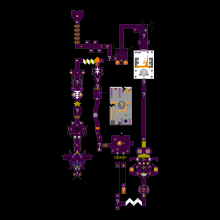 Black Rose mainly consists of a lot of straight narrow paths, heading in one direction with just a load of enemies in and nothing new to see, well, nothing new these days, but I'm sure enemies in narrow paths wasn't much of a big deal back then either. There were a few rooms lying around which were the parts of the game that made it more challenging and exciting but I would have liked to have seen a lot less narrow paths. Black Rose is also a one direction game. There's no left. There's also no Zayn Malik (I actually had to research that name because I don't give a bleep about that band) leaving either. Okayyyyy, what I mean is you're only heading one way, no other paths to explore, and no optional pathway choices, there's only one way to go, but I'd like to see more optional paths personally. This paragraph is going to be me talking about stuff that seemed to be quite common in a featured game back then but now are stuff we're not bothered by or possibly even hate to see. Okay, don't we all love a trap? I love falling into a trap that I had no choice of avoiding. There were two bunched together and this game and I don't get it. One was an optional choice teleporter. I mean, honestly? Is making the player lose the game when it wasn't there fault a good thing? Well apparently it used to be, I don't see any logic in that. And straight afterwards you see a power up boost, and I haven't tried it but I'm 99% sure it is a you receive the power up and you're trapped by the orange switch trap. Both incredibly annoying traps. Another thing is a load of scenery, artwork, poly's. Although I do give credit to the scenery in this game, I found it unique and made the game attractive. I personally think it could have been more consistent. And the final thing is the dull spider key battles. The only one I came across was the blue spider key but it's just killing the key. I would have liked to have seen something to make it a little bit more exciting such as some mortars rather than just there using your ray for 20 seconds. Overall, this game deserves a 3.5/5. Black Rose definitely isn't a bad game. It was challenging and fun to play, although by today's standard, I don't think it is quite feature worthy. I mean obviously I'm not going to unfeature it because it was four years ago and it's not far off anyway. Also it was probably worthy back then. But overall I enjoyed going back in time to play this game and would recommend giving this game a shot. Now lets jump back in that time machine and get back to... today?